A Guest Post by Andrew Mills from Andrew Mills Photography. Many of us spend a small fortune on our camera equipment trying to get the best quality we can, yet so many of us miss out on an important step that can make a huge difference to our photos. That step is to calibrate your monitor. You can view the same image on the same computer, and just swap the monitor for another and that image will look different on each monitor you try (even monitors of the same brand and model may not be exactly the same). As a result, you can’t be 100% sure that your images’ colour balance, hue, contrast and brightness are set correctly. You may be lucky in that your monitor is set up fairly well by default, but this can not be expected. The image below is a photo of a section of my laptop screen (it is an actual photo, doing a screen grab won’t capture the effect the monitor has). Actually, it’s a composite of two photos – the upper right half is with no monitor profile, the lower left half is with the profile active. As you can see, by default, my laptop screen is a tad too dark and has a horrible blue cast – this is something I had not noticed until I had calibrated it. If I edit an image, set its colour balance and brightness and contrast with the uncalibrated screen, I will be unwittingly compensating for that extra blue I see, so I will end up adding yellow, or taking blue away to make it look correct – this means that any resulting prints will have a yellow cast. You will then spend ages swearing at your printer, fiddling with its colour profiles and wasting loads of ink and paper (and money). If you’re lucky, some labs will colour correct images for you – but don’t expect professional labs to do so as they expect you to make sure it’s correct beforehand (unless you ask – they won’t change an image in case they “mess up” and intentional effect). So, by calibrating your monitor, you are “standardising“ it – any photo you edit on your calibrated monitor should look the same on any other calibrated monitor, and should also print with little or no adjustment, and it should come back from the lab and look as you expected. So how do I calibrate my monitor? Photoshop and Paint Shop Pro both have utilities built in where you can do a basic calibration. To be honest, in my experience they are next to useless (but possibly better than nothing). Look in your editing application’s manual to see if it has this built in, and how to use it. The best option is to get a colorimeter – I use X-Rite’s (AKA GretagMacbeth) i1 (AKA Eye-One) display 2 (supports both PC and MAC), which looks a bit like a computer mouse. Once the software is installed, you plug the colorimeter into a USB slot, fire up the software and place the colorimeter on the screen. You’ll be asked whether you want “Easy” or “Advanced” – most people will only need “Easy”. You’ll be asked what sort of monitor you will be testing – you will have a choice of “LCD”, “CRT” and “Laptop”. Even though your laptop has an LCD screen, you still choose Laptop. Click the right arrow. Place the colorimeter onto the screen as shown. Click the right arrow. There’s no screen grab for this bit as this is where the software does its thing – it will “find” where the colorimeter is on the screen, then will display blocks of colour for the colorimeter to read and analyse. This will take a few minutes and you won’t be able to use the computer while it’s going on, so now’s your chance to go and have a cuppa. The software takes the info from the colorimeter and builds a custom monitor profile that will be loaded at startup. You can change the name if you wish, but all you have to do now is click “Finish calibration” or the right arrow to save the new profile. And that’s it – the whole process only takes a few minutes and is well worth it. In most cases you will only need to do this once a month, so it’s not a great burden. Although, CRT users may want to calibrate their monitors more often as they tend to vary more with age and environment. There is a problem with colour management that affects some people, but not others, in Windows Vista and, it seems, still persists in Windows 7. On my desktop PC I don’t have any problems, but on my laptop the correct profile is not always loaded when it boots, and whenever the UAC requester pops up, the current colour profile is lost. To counter this, I use LUT Manager to manually load the correct profile. What else can I calibrate? calibration profiles for each paper type. Read more from Andy at Andrew Mills Photography. No, there are no "new" methods as far as I am aware, it's basically done the same. Although I believe the calibration tool I used and mention in this article has now been superseded by a newer model. The poor man's display calibration method. Thanks for the information. Even though this article is old, it's still helpful. I wonder if there are any new tricks that have came about within the last year? I just purchased a new Samsung Laptop and I need to calibrate the screen.. At least I think I do??? I bout the dell U2211H and I cant seem to get it to match my camera lcd screen. I upload thepics from the camera and they all look darker on the Dell monitor. Is this a normal problem, and is supposed to happen? I very much appreciate the clarification, advice and shared thoughts. It was not time-wasted! A while ago (and a little while after I write this article) I did a little bit of research on Adobe Gamma (Adobe's visual calibration tool). Adobe Gamma was last bundled with CS2, and was dropped with the released of CS3. The thing is, while calibrating “by eye” can possibly be better than nothing at all, it's just not as accurate or as good as using a proper tool. However, it appears that the main reason why Adobe dropped it is because Photoshop is a professional tool aimed at professionals. Adobe expects these users to already be, or should be, calibrating their monitors with an appropriate tool (they are now reasonably affordable and within reach of most of us) that is much more accurate than doing it by eye. There is also http://www.lagom.nl/lcd-test/ which has test images to help calibrate your monitor by eye. Adobe stopped putting Gamma correction in the Mac version with CS3. CS5 does not monitor correction software in it. Since it was all based on the human eye (your set up would look different than my set up) the monitor calibration was not very accurate. And if you take your file over to a new monitor it will look different than on your computer monitor. If you are printing your files, I have learned from lots of experience that ICC files are your friend and printing is an art, not a science. Test, test, test. My suggestion with a monitor is spend the extra bucks and get a high quality monitor; I have NEC and Iiyama montiors that work nicely. There are lots out there to choose from. I found it by doing a simple Google search: "how to calibrate monitor in photoshop cs5" . There are quite a few links there. This does not answer my question. I asked how to calibrate my monitor *using photoshop*. My old Photoshop Ver 7 did this just fine. CS5 does not??? This is a disaster. Regardless of whether or not $1000 CS5 does indeed still have the functionality my $40 PS7 has, getting a clear answer on whether or not CS5 does a specific function & if so how to go about doing so is like pulling teeth. This does not assist me in saving money therefore making money, yet it does succeed in doing the complete opposite. I'm very disappointed, Adobe. Can anyone help? I've got the x-rite i1 display pro, once the calibration is complete there seems to be a brownish over cast, i thought there would only be a slight change in colour on screen but it seems dramatic! ive done it several times and its exactly the same everytime. Also when i switch on my laptop it does not load with the new profile it appears eventually but then vanishes completely after a while and its back to normal. What is the best way to "test" that its right? Maybe slightly off topic but it is something brought up towards the end of the last post by "chuck". How is it that when I save a file as say AdobeRGB and print it on my home printer it comes out very close colourwise to my screen (when my monitor is calibrated)? Yet, as I understand it, my printer converts the AdobeRGB to CMYK to print it - and CMYK has a much smaller colour gamut than Adobe RGB. But if I convert the file to CMYK myself the result, both on screen and from an offset printer, clearly displays the smaller CMYK gamut. The point being that with a calibrated monitor I can print, for example, vibrant emerald greens on my home printer but if I convert to CMYK (or leave the offset printing company to make the convertion) I just get dull muddy greens. To finesse this discussion, once you have your monitor calibrated you'll need to make a soft-proof using the printer profile that you'll be printing with. Most of us (I would assume) use the profiles that came with the printer. Making a custom printer profile is a WHOLE 'nuther story! This soft-proof will preview the image pretty much as it will print, and it can be quite different than the non- softproof. Photoshop will display a softproof; Lightroom 3 will not. Hopefully it'll be a new feature in LR4. Apple Aperture, I dunno, but I think it will make a softproof. I used to work as System Admin in the prepress department for a large, high-end commercial printer here in Seattle, and one of my responsibilities was to calibrate the monitors, four different proofing devices and two large 40" Komori 5-color presses, making sure ALL the devices critically matched each other. Even with the best equipment money could buy, I'm here to tell you that this color management stuff is Voodoo magik. Maintaining the network, backups and servers was easy compared to maintaining the color management. Oh, yeah – one more thing to think about: your monitor will NEVER exactly match your printed output, simply because you're comparing two separate and different color gamuts – RGB for your monitor, and CMY(K) for your printer. Like "mac" above said, give it up and work in BW! Ah, film, chemicals and darkrooms . . . those were the days! Having discovered the effect of the temperature adjustment with ColourEyes, I found that the Spyder software also allowed you to use a custom temperature, though you have to excavate the Advanced options to locate how. So I've now managed to get a decent-looking profile with Spyder, too. But Charles (above) is absolutely right - after going to all this trouble, you have no control at all over whether your images will be viewed on awful or wonderful monitors, well or poorly adjusted. Having your images projected is an even worse minefield. And even professional prints of images that you've profiled for the specific commercial printing machine are hit and miss, so what you get out of your cheap inkjet is a complete lottery. Colour is so tricky, I'm increasingly inclined to work in black and white. I've even started using BW film again! Problem is your monitor may be calibrated, but then you put your photo up on web and it is seen by people who do not have their monitor calibrated. Look at the photo on 100 different monitors and you will see 100 different versions of it. Printing. Even if you have a calibrated monitor it is still an art to get a print out that looks perfectly like what is on your screen. Reds are very hard to match perfectly no matter what the set up. And usually most photos/graphics need to be desaturated a bit because the color is too intense. Then after printing one puts on a varnish over the print, the colors change again. The blacks are then blacker. Another amen for the Spyder 3. It is a great investment (only $70), particularly if you're shooting for clients. My wife and I had a realization two summers ago how off monitor color can get when we were trying to choose paint for our living room while she was out of town and looking at color samples online. With a calibrated monitor, at least you know your monitor has it right. Great post! I have the i1 and it works great on my laptop, but I have trouble calibrating my external LED monitor that I have hooked up to my MacBook. Any suggestions? Should I use the LCD mode or the laptop mode. Any help would be great. You could possibly try FLUX, which will adjust the color of the monitor, but you do have to do it with a slider, and it does have its limitations. Very insightful topic. Something that i have been reading up for awhile now but couldn't really find a useful write up! This is very useful! Thanks to some followups to my post, I went and searched a little more carefully and found this item for a more reasonable $199. Don't know what items I obtained on my first google, but this is much more palatable. lensrentals.com has some calibrators for rent. I have not rented a calibrator, but I have rented equipment from the company. Mpix.com also includes color correction when you submit an order, unless you check 'do not color correct.' there is also a basic kit you can get, they send you a print of an image and the same image on a cd, and you must match them. Shop around and you may get it cheaper, I think I paid about £125 (UKP) which is around $200 at current exchange rates. you know - I started reading this article and thought to myself that maybe now - finally - I would pursue calibration. But then I went to Amazon to price one and found it was in the THOUSANDS of dollars (US$) and said wtf !!! I read somewhere that getting an 8x10 print done at a good lab is an excellent check of your monitor. If the print and the on screen image look the same, you are close enough. However, if it looked good on screen but the print comes back with problems you need to do something like this. The key here is to use a good lab that won't "fix" your image, but will print it exactly as you submitted it. Color casts, too dark, too light, etc. would be the real test as your adjustments have messed up most of the time, not the lab. can you provide a link to the monitor calibration? I bought a used HueyPro from another photographer when she was having a studio clean out sale for less than 10% of the new price. It works continuously, so I am never worried about going too long between calibrations. Oops, I got cut off . It is worth it just to have the confidence that others will be able to see your work just as you intended them to. I've just bought a 21'' Apple iMac computer and love it! However the screen is ultra glossy, contrasty and too black. I've tried recalibrating it with the inbuilt software but it's not much better. I'd be happy to spend the money if I knew it worked well on that screen, but I've heard on forums that it can create a yellow cast on the glossy screens. Has anyone else got a new imac and calibrated it with any success? Thanks for that article it takes a lot of the mystery away from something I have been a bit afraid of using. On upgrading to Windows 7 I could not get my Epson R800 to print anywhere near correct colour when printing direct from photoshop & prints were very dark. In desperation I tried printing direct from the Windows "my photos" file and was blown away by the colours which perfectly matched my LCD screen and still do. Prints are much better now than before the upgrade. Was that just a fluke or is there some clever software at work here? I also use a Spider 3 Pro and there's one question I've asked myself. To what color temperature should I set the calibration? (The Kelvin value I'm supposed to set during or after calibration). An important consideration not mentioned in the article. Wait at least an hour after you turn your monitor on before calibrating. This will ensure the monitor has fully warmed up. Andy Mills, I admit you have a point when it comes to regularly calibrating your monitor, and its true if I owned a colorimeter I'd use it quite often, for the reasons you mention - saving time and hassle, but also for the extra confidence that you won't constantly have to worry about fine-tuning the color profile all the time. With that being said, how is the sensor in any old digital camera different than the one in these devices?? A proper colorimeter will certainly be designed and optimized for color accuracy when you take it out of the box, but so too are most digital cameras (though maybe not to as high a standard). Frankly I'm surprised there isn't a software tool or an app that could use any camera, even the one in a phone to measure the output and generate a corrected profile. *note - we used easy mode and then i did advanced mode and got even better results, but it took awhile to figure a few things out. Thank you so much for this article. I just spent last weekend looking for information on calibrating my monitor. Prior to that I hadn't even realized that my monitor might be my problem (instead of blaming the print company). If I am going to spend hundreds of dollars (or thousands) on camera equipment it only makes sense to spend a couple of hundred making sure my monitor is really giving me a true picture. Again - thank you! the i1 Display 2 will be my next purchase. @Stacey - Total City Girl >>> Are you using an iMac? The 'magenta/pink' cast is a widely observed problem when attempting to calibrate the iMac LCDs with Spyder3. The Spyder3 software does not seem to give good results with the iMac. I've been told that using the ColorEyes Display Pro software to drive the Spyder3 sensor gives better results, but I have not had enough spare cash to buy ColorEyes yet, so I can't confirm that. 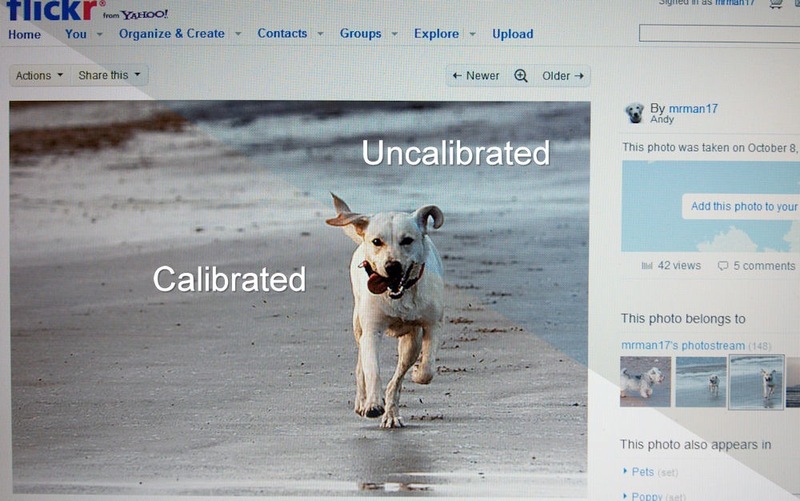 Monitor calibration isn't just for printing or editing, but how others view your work online. Not having a calibrated monitor will make your pictures on the web and others computer look far different than you intended. With calibration you are at least standing in the "middle" of the color, brightness, contrast, so you image will look reasonably good to nearly everyone. With printing monitor calibration is 100% necessary. I not only print for myself, but my customers, and some print shops. If they send me their ICC profile of their monitor I can print to their monitor and have less complaints. Papers also have different temperatures and brightness levels. Having your monitor calibrated will leave you with less guess work when the paper temperature is different and the adjustments are known before printing in the first place. - i.e. when I print on some canvas it's a bit "warmer/yellow" so I adjust accordingly. When I print on some matte papers its cooler/bluer, so I can adjust accordingly. On the complaints of the calibrator. Sypder, X-Rite and other companies have great products. The willingness to spend money on gear [cameras, lenses, flashes, etc] is easy and makes sense. What doesn't make sense is delivering a final image that doesn't look as good as when you took it. A free calibration [non-hardware] is Adobe Gamma. It gets close, but only measures brightness/contrast. You still need to deal with warm/cold issues. I just calibrated my monitor last week using the i1. I performed both the easy and advanced modes and would definitely recommend the advanced mode over the easy, as it will also adjust your luminosity and contrast of your monitor. Made a big difference in image quality for my monitor, as compared to using the easy mode. FYI: X-rite has a video tutorial that is excellent. It's part of their Friday Photo School series (https://fridayphotoschool.com) Some of the archived downloads are free, including the Will Crocket webinar "Monitor Makeover for Perfect Color". The other X-Rite product I love is the Color Checker Passport for white balance and color correction. Can't shoot without it anymore. I bought a Spyder 2 several years ago and it has to be one of my best buys ever. It makes such a difference to viewing pictures. Prior to this I tried calibrating my monitor with Adobe's own calibration program as well as others that I found on the internet and found them all pretty much useless. You may only need it once or twice (although Spyder recommend that you calibrate your monitor every 2 weeks) but it is well worth the initial outlay. I have also calibrated my laptop but I find that I can not use it for photo editing, because it has such a narrow angle of viewing. 1) The cost - it is an on going thing, and not something you do once or twice. Ideally the monitor should be calibrated at least once a month (to be honest, I sometimes go up to 6 months between checking it) as the monitor's output changes with time, age and use. Environmental factors like temperature can also have an effect. You do also save money with prints and ink if you have to keep printing an image because there's a colour cast caused by the monitor being off. 2) As I said in the article, Photoshop (it may not be in later releases, I've not been able to check) and Paint Shop Pro both have software based calibration tools that you judge by eye. I assume that other editing software also has something similar. If not, there are other free tools like quickgamma that you can use: http://www.quickgamma.de/indexen.html but it won't be as accurate. @Stacey - Total City Girl - If there is a strong light getting on the screen, that can "fool" the meter into giving a false reading. But for me it has saved me a lot of time and hassle - I now know that when I print an image on my own printer, or send it off to a lab, I don't have to worry about it being too dark, too light or having a colour cast. I've not had to re-print an image for this reason in years. I agree with most calibration hardware/software combos are just way to pricey for the enthusiast/armature. what I use is QuickGamma which is available free to use at http://www.quickgamma.de/indexen.html. Years ago when I used a CRT monitor, it was recommended that prior to calibrating, I use the monitor's menu to increase contrast to 100% and lower brightness until white looked like white, not grey. Do you have any suggestions on pre-calibration procedures for an LCD monitor? This is the first calibration article I've seen that includes laptops. I'd LOVE to calibrate my monitor, but I can't afford these options. Really hope someone can find and share an affordable alternative! Great- thanks for this info. I've been putting this off for too long.. Think Ill finally act on it..
Any way of calibrating the monitor without using a colorimeter? any software recommended? I have a laptop also and use SPyder 3 Pro. It looks similar to what you just described. I had a similar situation where I didnt realize how blue everything was until I calibrated it. My problem now though is that it seems like there's a pink hue to everything. Not sure if it's just me or if that's just how it's supposed to be Have you seen that? Ion, I've got a Spyder3 Express. I never know where to set my contrast, brightness and sharpness because it only calibrates color controls. Any suggestions for these adjustments? What about multiple monitor setups? Will the color profile for one monitor mess up the settings for the second monitor? Yeah... great, but what if I don't have that shiny colorimeter? I'd love to calibrate my monitors but the X-Rite Eye-One is a tad pricey for me. Can these things be rented, or are there services that do on-site monitor calibrations at a reasonable price? And, how often does a monitor need calibration?